Learning how to design gardens can be tricky and frustrating. We offer complete garden design and landscaping assistance from free garden plans, to budget professional designs and even to turnkey landscaping solutions. You will find the perfect solution for your garden on this site. Your friends will likely refer you to a Professional, saying “they know what they are doing…” but why pay a fortune when you could learn their secrets for yourself. Our standard garden designs make it easy for DIY enthusiasts to landscape their own gardens to professional standards. The designs are complete in all aspects and customization guides describe in detail how to adapt these designs to suit your garden. We even provide installation instructions. It has never been easier or cheaper to get a professional garden. A brand new Japanese Garden Designs Package has been added to our portfolio. It combines our best Japanese designs into one low cost package, ready for instant download. This offer expires soon. Have a quick look at our three featured garden plans to the right. We also have many more flower garden designs on sale. Now is a good time to finalize your garden design. How a Low Cost Garden Design Can Increase Your House Value by $30,000? Design Gardens are experts in garden and landscaping design and are geared to assist you in adding value to your house in the most effective way. Chief Executive of the National Association of Estate Agents. The very first thing visitors experience is your garden. A beautiful designed and maintained garden immediately creates a welcoming atmosphere. It creates a feeling of quality and value which goes a long way in covering other shortcomings in your house. Design Gardens offers a number of different options to improve your garden, from free garden design information, pre designed gardens that are easily customized to suit your requirements and professional garden design services. No matter which route you choose, the value of your home will be increased by improving your garden. “In current market conditions, home owners hoping to sell need every advantage. The exterior of a property is a huge selling point …"
Head of marketing for Green Thumb. Design Gardens will help you to design and landscape your garden. Follow our simple steps and design a garden that will be impressive and spectacular. Here is loads of information on garden design and landscaping. You don’t have to read tons of books to find the information you need. Lacking inspiration? Our residential landscape design services offers you the opportunity to purchase a custom design that suits your own garden and home. Remember we have a solution to fit every pocket! We won a Gold Medal for this garden design! Winning Gold awards at garden shows doesn’t come easy. It takes a lot of dedication and attention to detail. At Design Gardens we apply the same dedication and attention to detail that won us gold medals. Follow our formula and you too will have a beautiful garden that adds great value to your house. You are guided from the selection of a garden style, through all the steps right up to the final planting. Adapt our ideas to suit your own taste and garden. Just follow the simple steps and principles of garden design, and create your dream. If you don’t have the time, let us design your dream garden online. The Garden Landscaping Industry is Changing. Our parent company Southern Inspirations has launched a new Gardening Website that provides huge benefits to DIY gardeners. Membership is still free. Join now and start benefitting immediately. 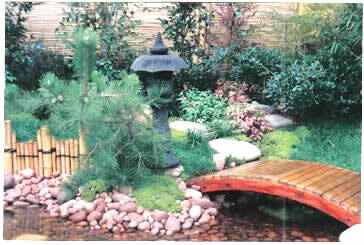 We are also providing an unique collection of garden designs that can help you transform your garden into a show piece. Read all about this new development and find out how you can benefit, in our flower garden plans. Start increasing the value of your house now and reap the rewards. You’ll find this one of the better investments you have ever made. Purchase a Garden Design. Looking for great ideas to make your garden special? Visit Garden-Fountains to see some beautiful Water Features. You can create your own flower garden design even if you are not creative or don’t know a thing about gardening. Design Gardens and SI Garden Design have joined resources and created an alternative to expensive landscaping costs. Learn more about our ground breaking solutions.